The company reported net profit between July and September reached CoP$3.24T (US$1.8B), which meant a decrease of 22.6% compared with the same period in 2011. Ecopetrol said that operating revenue increased one percent from the same period of 2011 while cost of sales increased 20.3%, due to maintenance costs of CoP$147,000M to ensure the integrity of transport infrastructure and wells, as well as the maintenance of Barrancabermeja refinery. Azabache Energy, with oil and gas interests in Colombia and Argentina, published its year-end 2012, calendar 2Q12 results. The company reported a increased loss of CAD$6.6M including a charge for the impairment of certain assets in Argentina. 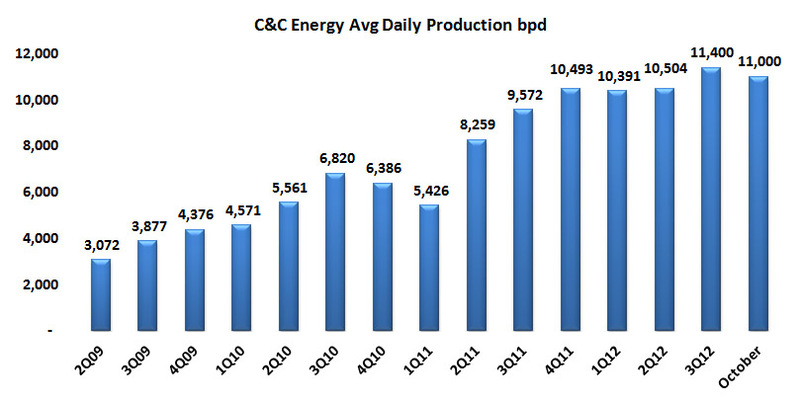 It also provided an update on its exploration activities in Colombia and Argentina. Early on in the Talisman 3Q12 results conference call, new Talisman CEO, Hal Kvisle, said that he would be visiting Bogota within a month. Given earlier statements he had made about exiting non-core assets and an announcement that the company would be leaving Peru, we wondered if his visit was for a goodbye party. We were very pleasantly surprised to hear the opposite. Canadian services firm Zedi Inc has selected PetroTiger, a Colombian oil services firm with operations in Colombia, Ecuador, Argentina, Mexico and Panama, to resell its services. This is the first time that Zedi has authorized an international reseller. 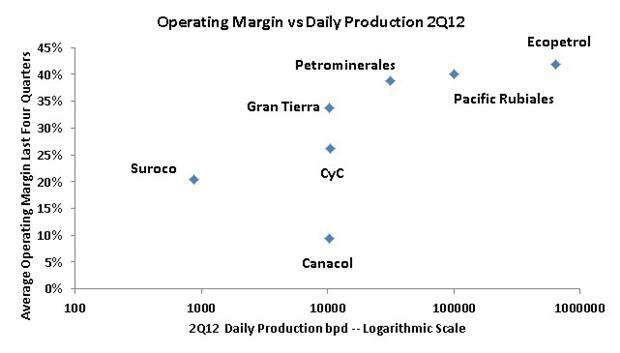 We have been collecting financial and operational data on the companies with significant production in Colombia. Our database goes back to 2009 and so far covers nine companies in depth. The seven in the chart are sufficiently mature for us to estimate their average Operating Income for the last year. Economic theory says that larger companies in terms of revenue should have better margins if only because they can spread their fixed costs over a bigger base. Sometimes larger companies lose this advantage by being bloated and inefficient. Ecopetrol and Chevron will upgrade the compression facilities at the Chuchupa field to increase its daily gas production. For this, the field will be off-line from October 30th to November 3rd. More maintenance will take place at the end of the month. 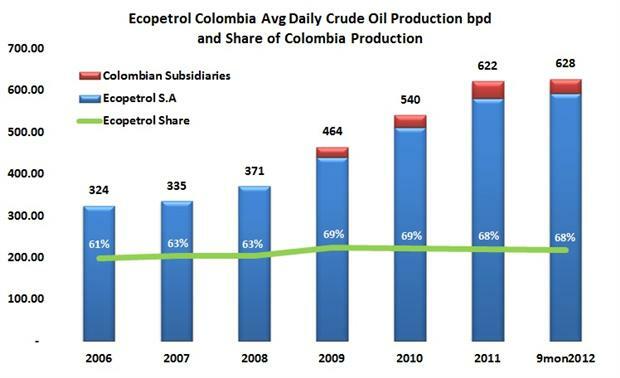 From an Ecopetrol press release, translated and with commentary by Hydrocarbons Colombia. During the National Hydrocarbons Agency (ANH) conference in Cartagena last week, Ecopetrol and the China National Petroleum Corporation (CNPC) signed an agreement to develop exploration and production opportunities both in Colombia and other countries. Here is an Ecopetrol press release on the agreement, translated and with commentary by Hydrocarbons Colombia. Just before the National Hydrocarbons Agency conference, Canacol announces it is purchasing Shona Energy for a mixture of cash and shares.